Ceremonies in which children participate are wonderful. I’m not talking about the angst some couples have re: how to word their invitations to diplomatically exclude children from the guest list. I AM talking about actively and lovingly INCLUDING your children in your ceremony. Whether they are residing in the bump under your wedding gown, or they are your energetic toddlers, step-children, nieces and nephews, or older kids, I believe it is important to include children in whatever ways are appropriate or special and meaningful for you. Typically, the marriage of two people who are in the midst of the joys and challenges of raising tiny humans is just as much a celebration of the family, and the “team spirit”, as it is about the love between the two adults signing on the dotted lines. Many couples come to me and say they want to include their children in some way, but don’t know how. They are stuck on the “traditional” roles of flower girl and pageboy, and are searching for some more contemporary inspiration. In this respect, it is no longer a case of children being “seen but not heard”. In fact, giving the children a speaking role is a fabulous idea! Here’s where you and I can work together to find out what will work best for your unique family. 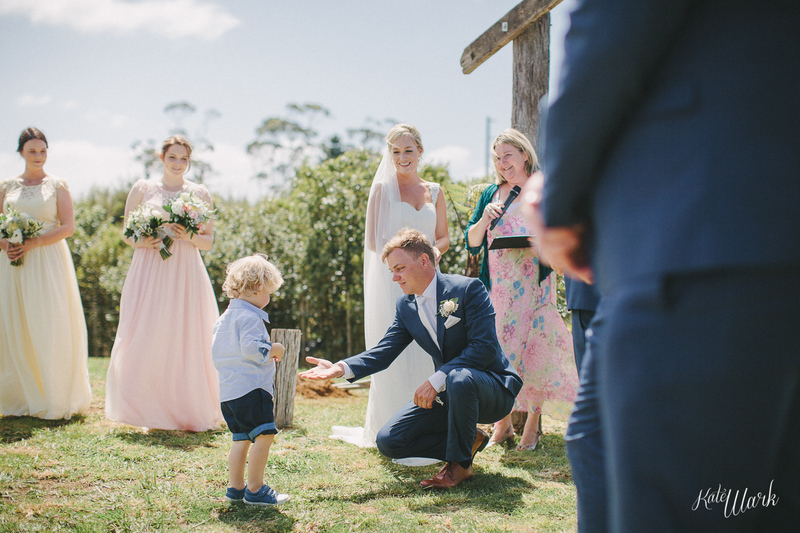 From my perspective as your celebrant, it is always important to acknowledge your children and welcome them, by name, into the ceremony. If they have been part of the arrival procession (think little girls dropping petals, waving wands, blowing bubbles, or hauling their infant brother in a wagon…) then once the ceremony begins, I will speak directly to them and tell them, on your behalf, how delighted we all are that they are here. Depending on the age of your children, they are very welcome to stand or sit by your side, or be held by you during the ceremony. During the “manifestation” of the ceremony, that is, the middle bit where cool stuff is said and done, many couples choose a ritual or enactment that symbolises the unity of their family. Some have a colourful sand ceremony, (what pre-schooler doesn’t like to tip and pour?! ); lighting a unity candle; you could get messy with science, and concoct a whiz-fizzling explosion of vinegar and baking soda to demonstrate the chemical reaction of each of you playing a role in your family; or keep it neat and tidy by re-mastering the hand-fasting ritual to include a group hug and a literal “bundling together”. You could adapt the “wine box” ritual, where love letters between the marriage partners are sealed inside a wooden box with a good bottle of red, and include love letters to or from your children. Imagine the delight at breaking open this time capsule and reading the notes in years to come! Inviting children into the sacred space of your ceremony brings a special emotional energy to the gathering. Where the bride is pregnant, it is fitting to offer a blessing for the unborn child at some point too. (I’m not getting teary, there’s just something in my eye). Children bring laughter and fun to an event which is often packed with nervous tension. Sometimes it is literally a case of “out of the mouths of babes” lightening the mood, like the time I told everyone, “today, we celebrate love”, and a curly haired Master 2 shouted, “LOVE!” with absolute conviction and delight, and everyone got the giggles! Older children could be invited to read an age appropriate poem or story (“Guess How Much I love You”, or something from “Pooh Bear”); or you might choose to make promises to the children, just before exchanging your own marriage vows. Gifting something to your children, such as an engraved necklace, bracelet, or a pewter money box is a small but significant reminder of their special part in your big day. Kids are spontaneous and yes, they throw us curve balls. Once, standing with a couple in front of a spectacular bridal arch created by an old wooden dinghy, their cute Master 3 suddenly started pulling his Daddy’s shirt. “Now, daddy, I need to go now!” he whispered….and with a quick “Excuse me!” the two of them ducked behind the boat for a quick “tree-wee”. There was nothing the bride and I could do but laugh, wait, and go with the flow (so to speak). As a Mum of 4 young children, pretty much nothing phases me when it comes to “working with children” and it is one of the greatest privileges of my role as your celebrant that I get to do so. Give-and-take works a charm – a toy car in your pocket to swap for the rings when the time comes to ask Master 3 to hand them over is a good trade! Spontaneity, wrapped up in tradition, never fails… think horse-shoes for good luck, handed unprompted to the blushing bride at the ceremony’s end. (This is quite possibly one of the best photo opps of the day… and I can say this with certainty because as a 2 year old, my very own waddling fabric-nappied tush was front and centre of a Lambton Quay photographer’s studio in an enlargement of my beaming newlywed Aunt and Uncle!) In the absence of that particular image, I invite you to enjoy this lovely moment captured by Kate Wark, Photographer, earlier this year.